Eternity rings usually have diamond content, although sometimes coloured gemstones like sapphires or rubies may be set to alternate between the diamonds. An eternity ring is the last of a set of three rings that is traditionally worn on the finger along with the wedding and engagement rings. Sometimes a wider eternity ring may be worn on the right hand. This is especially if the decision was to have a more unique design, rather than a matched set of rings. How long it is before you have an eternity ring depends on who you ask. Some will buy it at the same time as the wedding ring and make a matched set with the wedding. Others will tell you an eternity ring should be after one year of marriage. If totally left in the hands of the guys I have even heard ten years mentioned. 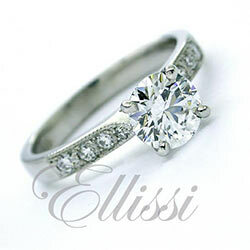 Some believe that an eternity ring should be given on the birth of your first child. I suppose what this all means is that the correct time frame is the time you feel is right.Whatever the decision on the timing, one thing is for sure, eternity rings should be made to a very high standard to compliment the rings you have. It does not in fact have to be an exact match to the wedding ring, as many people like the idea of having an eternity ring that is a little differing in design from the engagement and wedding rings. Trying options next to the rings you already have will help to clarify what works best and looks good. 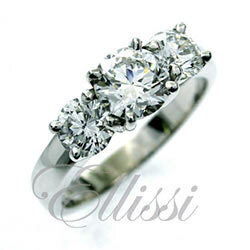 Diamond wedding rings can also be used as eternity rings. So feel free to mix and match these designs, after all there are not really any rules to what works. “Chic” Platinum Princess cut diamond set band.